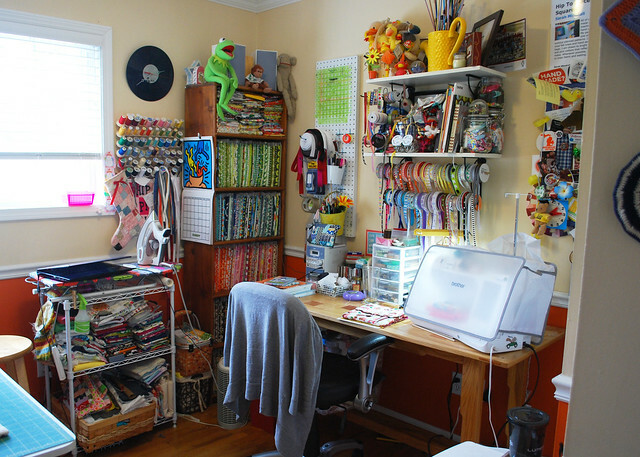 I’m constantly trying to rearrange my sewing room. I tend to think that I can never find a perfect setup because the room is small, but logically I know it’s just because I have a lot of stuff. But, since I’m not getting rid of anything major anytime soon, a reorganization was necessary. 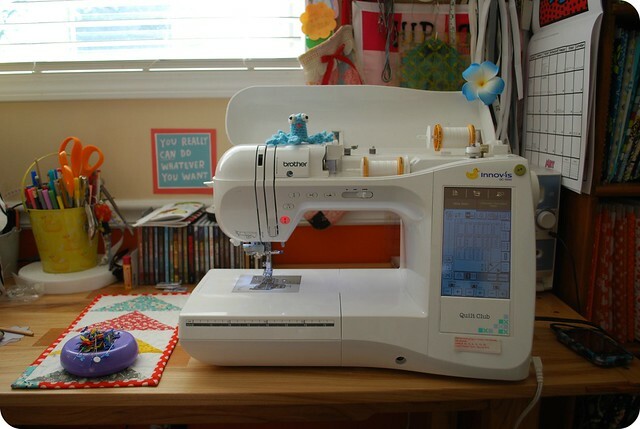 My sewing machine table is, for me, the best part of the room. Not only does it house the actual machine, but my husband, Ben built it for me with his mad woodworking skills. It’s even got cherry inlays on the top to look patchwork like! The problem, however, has been where I can put the table comfortably in my space, without sucking space away from my large cutting table that takes up one whole wall when completely opened. Before, it sat at a 90° angle from the cutting table, and I felt like it wasted a ton of space in the corner. Now I’ve got my sewing machine across the room for the cutting table (with my small sewing machine set up in one corner of that) and my small ironing board in between on the third wall. There’s not really much room on the fourth wall. The closet takes up most of that space, and due to our house’s original furnace chimney that snakes up behind the wall next to the closet, the remaining part of the wall has an extra corner that’s not very useful. 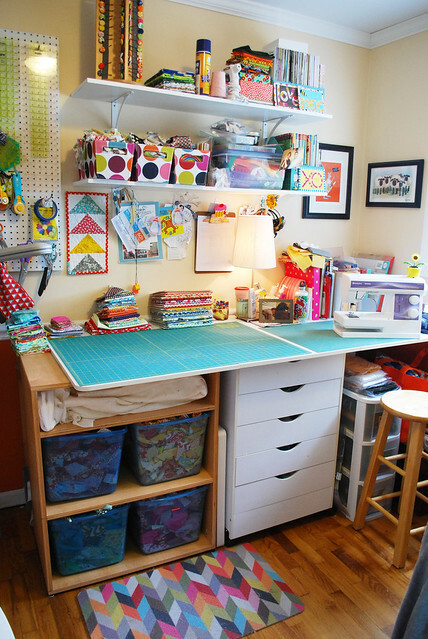 On that wall, I placed two sliding drawer bins that I use for fabric storage for pieces that are less than 1/2 yard cuts. For cuts of fabric that are at least a 1/2 yard, I store them in Ben’s childhood bookcase. 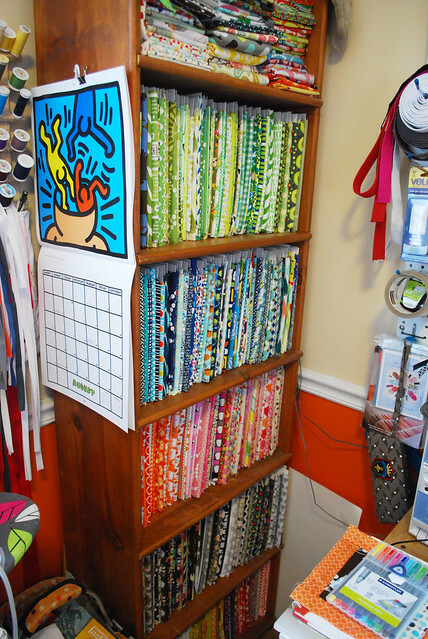 Five of the shelves are tall enough to use comic book cards to wrap my fabric and the top shelf I use for leftovers. I’m actually at a problem here, because 1.) I’ve run out of comic book cards and 2.) 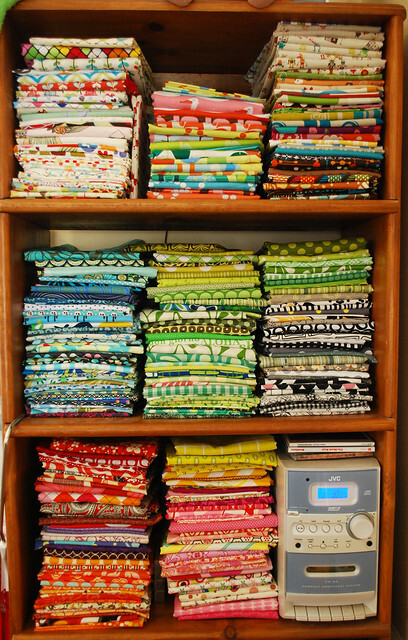 there is no more room anywhere on the shelves to put anymore fabric. I have a pile of fabric that won’t go anywhere else, so for the time being, it’s going to camp out of=n my cutting table. Maybe I’ll cut it up, maybe I won’t. I sometimes wish that I could make the bookcase a little larger, but it fits well there, and I probably shouldn’t buy much more fabric until I use what I have anyway. 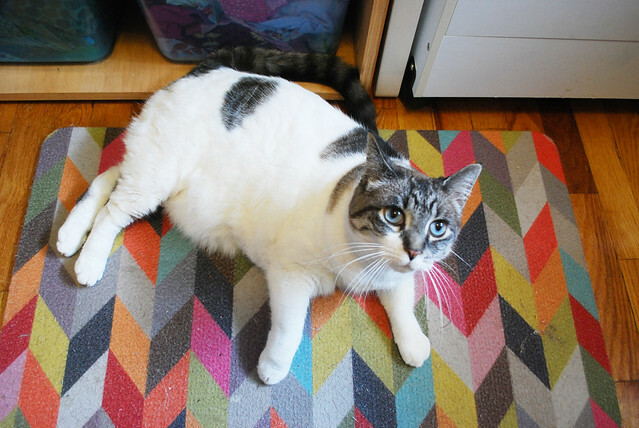 Also, I can’t find a place to put the cat. I should work on that next. 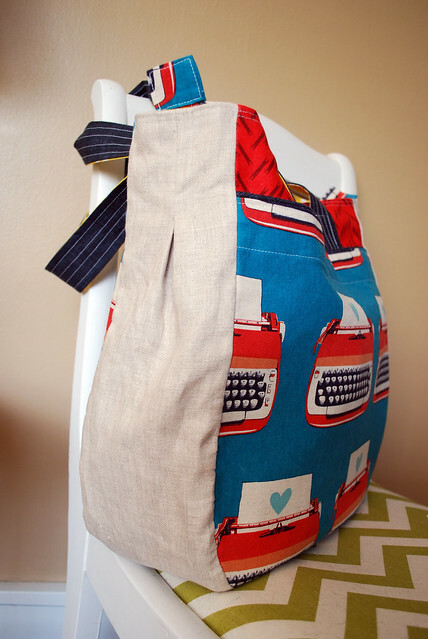 I am in love with the Super Tote I made this weekend. 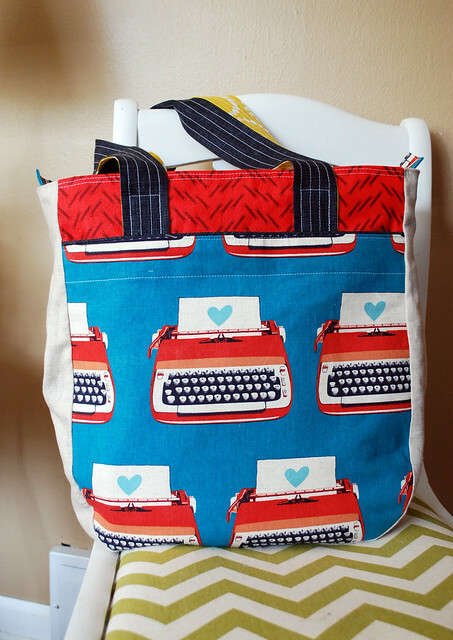 Seriously, this bag has typewriter fabric, linen with pleats, piping, and is mega sized…it couldn’t be better. In L-O-V-E. 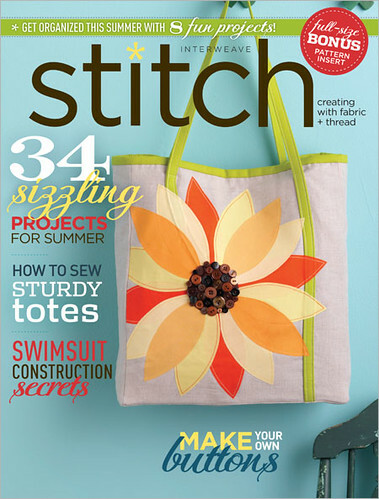 The pattern can be purchased here from noodlehead, and it’s so well written. The only problems that I personally had came with my own refusal to want to follow directions and to do things my own way. There were a few times that I wanted to get ahead of myself and skip steps, but when I would just slow down and read everything, the pattern worked out perfectly. I had ordered the Melody Miller typewriters last year to make pouches with, but I hadn’t realized just how large the print was. 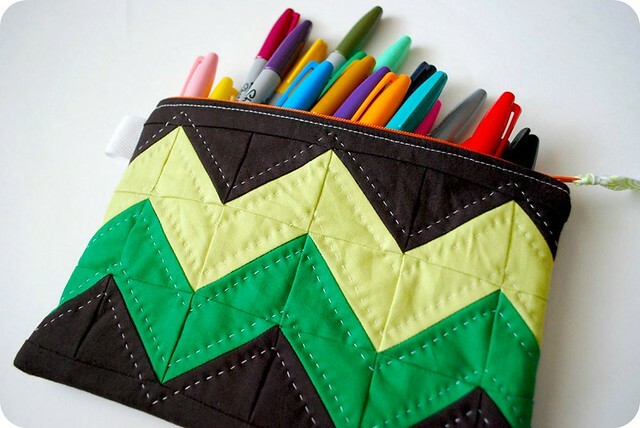 I tucked it away, and when I found this pattern, I knew it had a use. 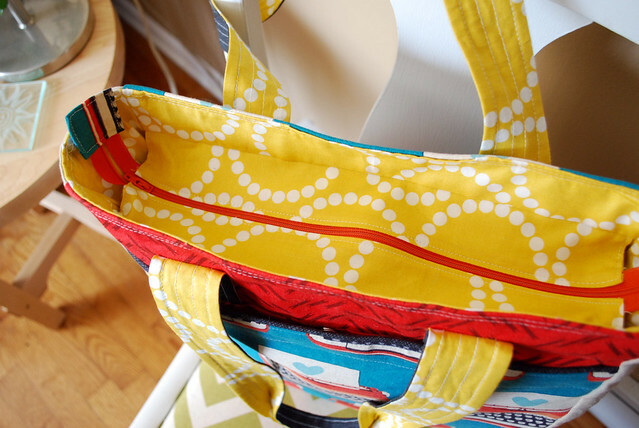 I made the front pocket, as well as the backside of the bag with it. The sides are just a medium weight linen, and I like how it crinkles, especially at the pleat. I made my own piping as well. I figured that would give me a lot of trouble, but overall, it was one of the easier parts of the whole project. The toughest part by far was putting in the zipper. I’m not sure if my main sewing machine just needs servicing (I know that it does), but I really struggled to make the stitching look neat both around the zipper itself, as well as on the zipper tabs. 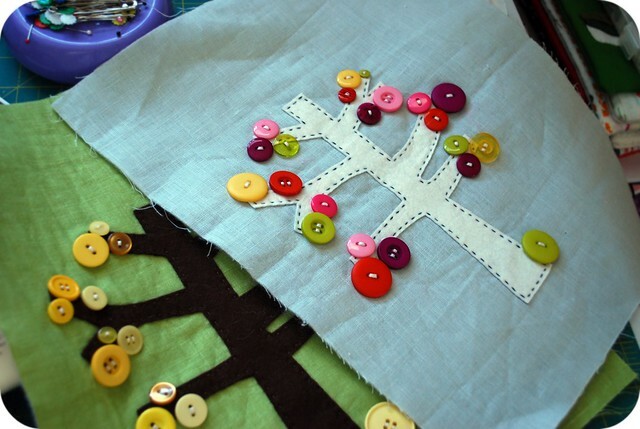 My Brother machine had terrible, messy stitches and I couldn’t keep the tension correct. I switched over to my Husqvarna, and things got a lot better. That little machine gives me its own share of problems, but it really helped me out with this zipper problem. It took me about two days to finish, but had I not had so many machine issues, I imagine that I could have finished it in one full day if I committed myself to completing it in one shot. I really need breaks during projects like this though, so I don’t let myself become frustrated. I’m really happy with the end result! 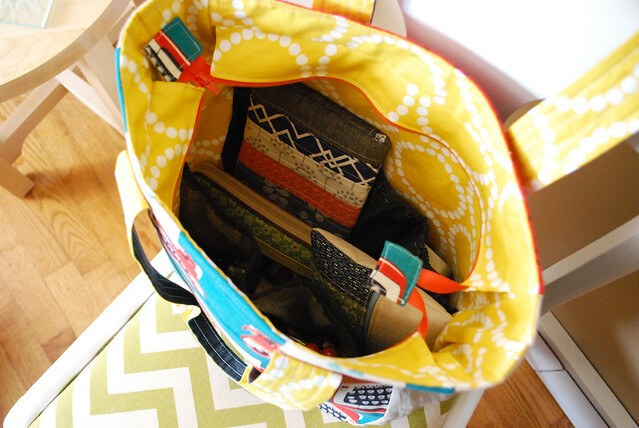 In fact, I’ve already packed it full of my things, so I know it’s going to get a lot of use this summer! I felt like the process of making this pattern was so much work. It was even more so than the several others that I’ve done for Stitch. I had it all planned out, but the majority of work in constructing it fell during my holiday show season this past fall. Talk about being SO stressed out. The fabric took forever to get to me, and I wasn’t able to begin in until much later than I would have hoped. But, even so, it was a project that turned out even better than I had envisioned it when I first started. Getting to that point of being finished and pleased with the result just wasn’t as direct as I would have liked it to be. So I think that’s what makes this feel so wonderful. Getting to the end result was tougher than I thought it would be, but sticking with it even when it drove me to tears was very much worth it. Also, I’m sorry to those kids I scared in Barnes and Noble when I found this on the shelf. 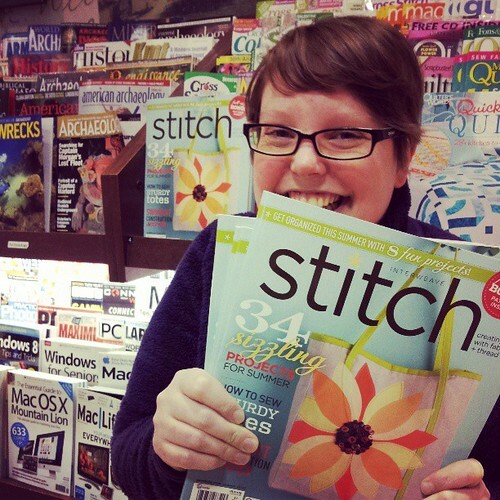 You’d jump up and down and pose in front of the rack if your pattern made the cover of your favorite magazine too, thankyouverymuch. As per usual, it’s been a little while. Okay, it’s been a long while. If you’re still reading, I’d like to give you a hug. HUG. Thanks for sticking with me. 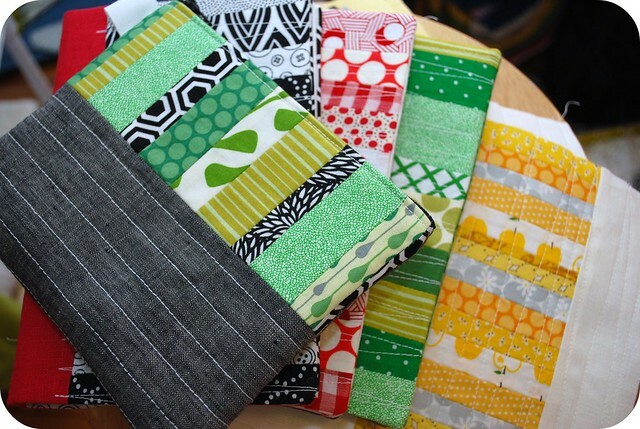 By far, the most exciting thing for me was being picked to have my sewn goodies have a new home at the Yellow Door Art Market in Berkley, Michigan this spring. 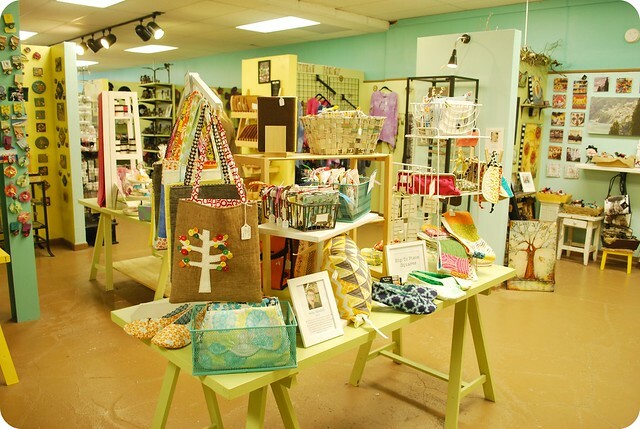 It’s a fabulous and well loved shop that has goods from about 60 Michigan artists on display, all the time. My spot is a cozy little green table near the register…just perfect! In March, I was Yellow Door’s featured artist of the week, and had a whole week dedicated to me and my work on their blog. 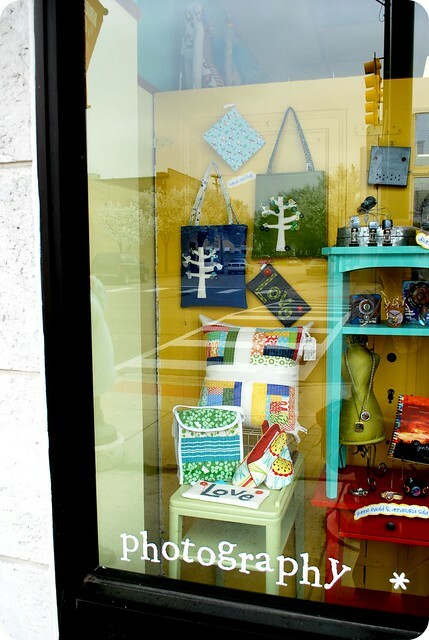 I even had a spot in the store’s front window for the whole month. That may be the closest I ever come to being a celebrity. 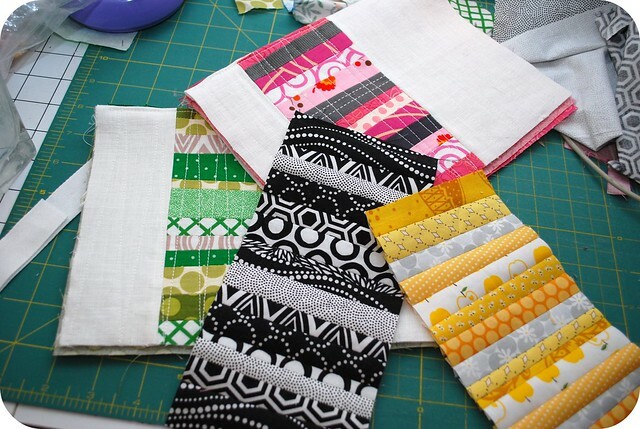 In April, just as I was starting to get ready to start getting ready for summer shows and keep my table at the Yellow Door full, my sewing machine took a dive. I was without my machine for two whole weeks. I borrowed a friend’s machine, but it wasn’t the same. Thankfully, my machine feels like it’s in the best condition since it first came home. 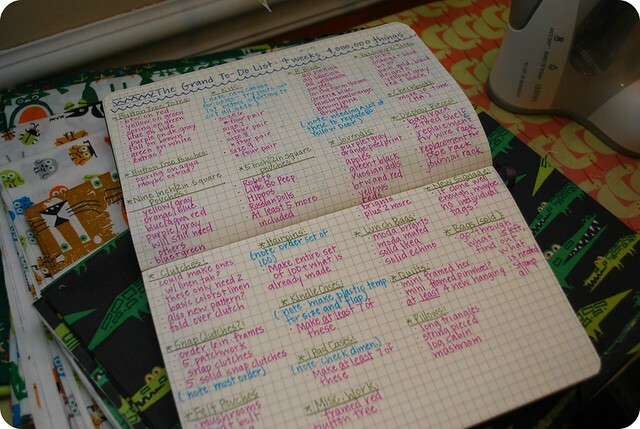 But while my machine was away, I went to crazy town and started making my patented, crazy lady, color coded lists. I actually lost it a little when I misplaced my orange pen (which was used to cross off checked items) and had to make a special trip to the store to buy one. Ben asked if I could just use another color, and I may have looked at him like he had two heads. OF COURSE NOT. ORANGE IS THE COLOR OF CROSSING OFF. I found my original orange pen two days later at work. Now I’m all set! But all that crossing off with the orange pen meant that I got a lot done! 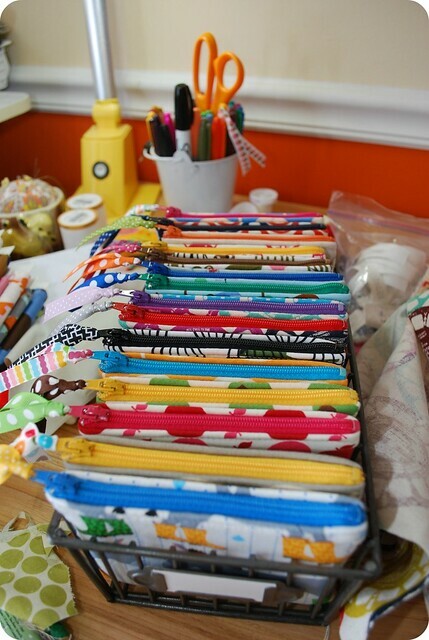 I sewed what seemed like hundreds of bags and pouches this spring. Maybe it wasn’t hundreds, but it was a lot. Pillows were also on my to-do list this late this spring. 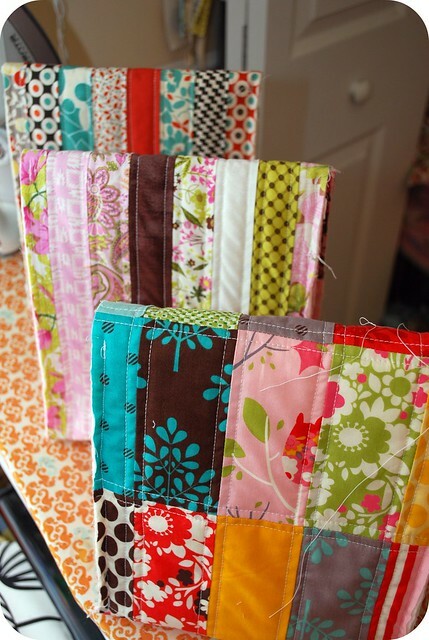 I want to do patchwork projects, and they can be hard to fit in with my other sewing obligations sometimes. I’ve been in a half square triangle mood for the past few months, and I imagine it’ll continue. 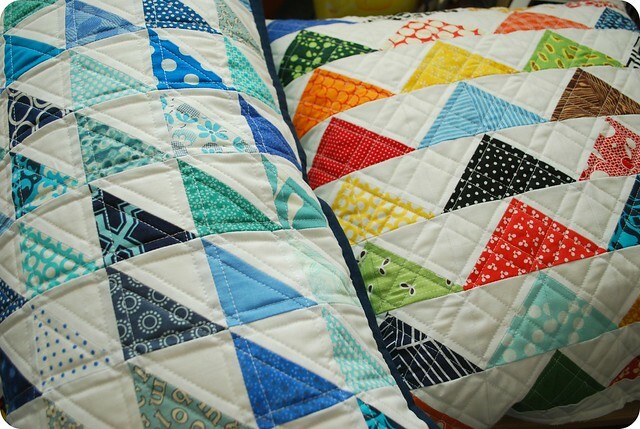 They’re just so much fun to piece and quilt. 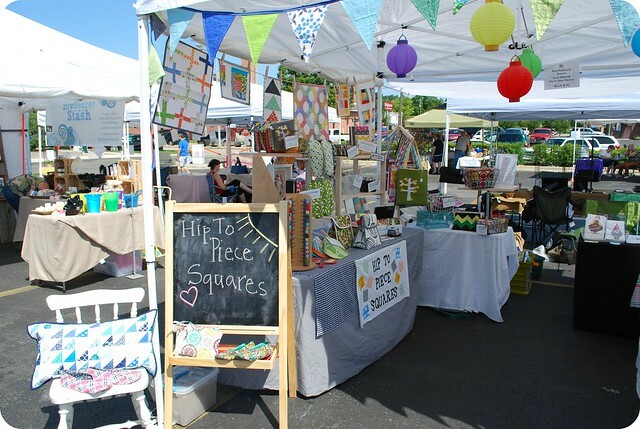 With the arrival of summer, also came my craft show season. I did A LOT of shows last year…12 total. I decided early on this year, and especially with the addition of the Yellow Door to my workload, that I would cut back, and only do my most favorite shows. This summer I participated in three shows, including Maker Faire Detroit and the Redford Michigan I-Art Festival. Great times were had at all, and now I’m looking forward to starting my fall shows. The pets had a busy summer too. 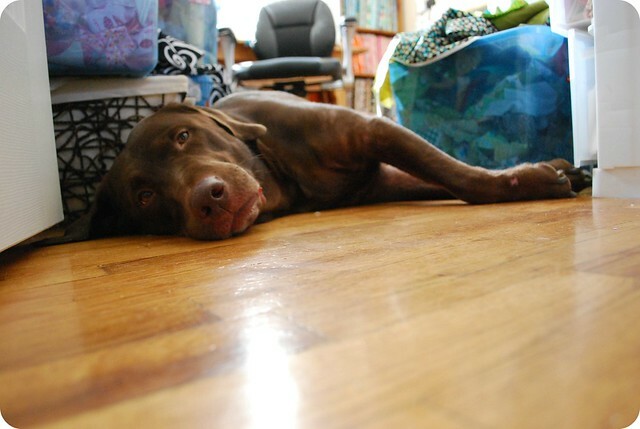 Hudson was a lousy guard dog most days at the sewing room door. I also was a bridesmade in my friend Laura’s wedding this summer! 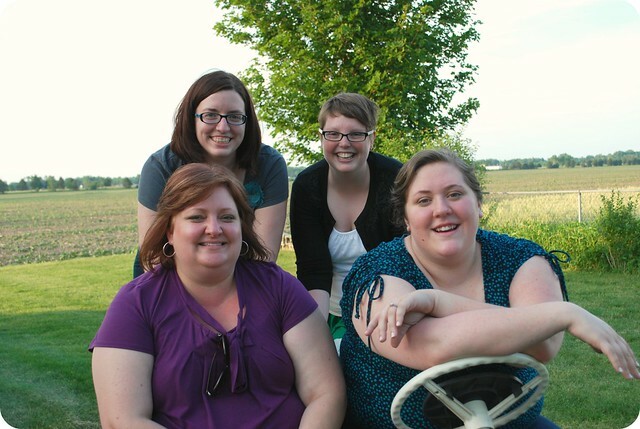 All four of us originally met at our now disbanded Brighton Modern Quilters group several years ago. The group might not have worked out as a whole, but I made some amazing friends there that I still continue to see and sew (or knit) with. It was a beautiful and fun (but hot!) weekend. One beautiful thing about 2012 so far is that I have felt so creative! I can’t fall asleep at night because I keep thinking of all of the things I want to make. New ideas don’t always work out, but on the whole, I feel like this has been one of the most creative years, ever. The discouraging thing is that I don’t physically have time to do it all, and that’s when I get frustrated. 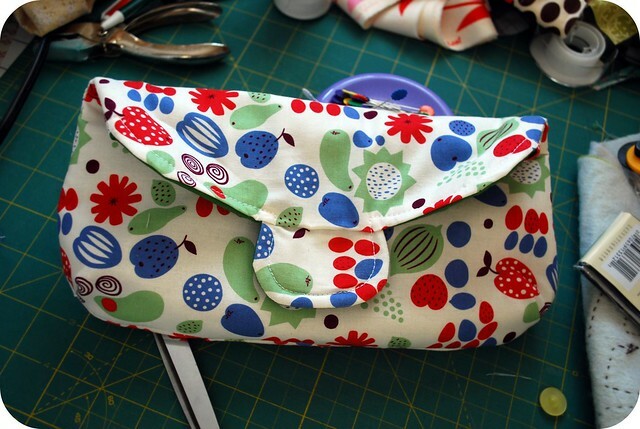 This pouch came out of an hour of pure sewing experimentation, and although I don’t think it’s quality enough to sell, it’s quality enough for me. Sometimes I like it when that happens, and I don’t feel bad keeping the items I make. So that, pretty much, is it for the past seven-ish months in a nutshell. Keeping this blog is by far, the toughest part for me. I love to write, I love to take pictures, and I LOVE to sew and make things, but it is SO hard for me to just say it. There are those who do it so much better than me, and it’s hard to compare yourself to that. But, I can look back over these notes and snapshots that I’ve taken over the years and know what I’ve accomplished for myself. I still have a long ways to go, and a lot more sewing to do. Ben: “Pat Schwirkey. It just sounds like someone who probably sells insurance at State Farm. So yeah. 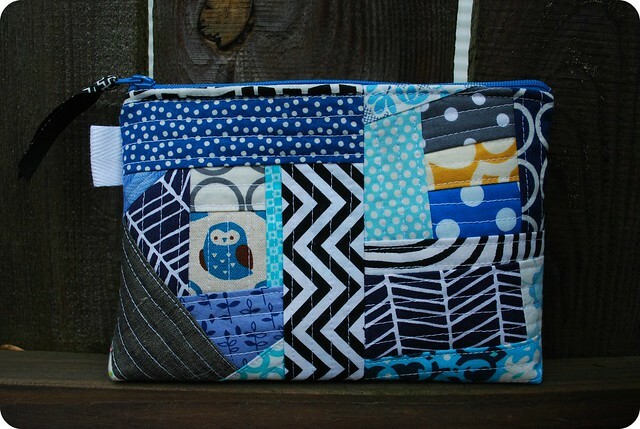 Here’s something patchwork-y made by the very un-insurance selling Pat Schwirkey. If I thought the few weeks of creative block was bad this past month, I had no idea what was to come. I was down for the count for a whole week of a stomach virus, complete with an itchy rash that kept me in bed for too, too long. But finally today I’m feeling lots better, and I am READY to get back to sewing. I’ve got a lot on my mind right now…I need to finish projects for people, craft shows must be applied to in the next several days….there’s loose ends to tie up everywhere. 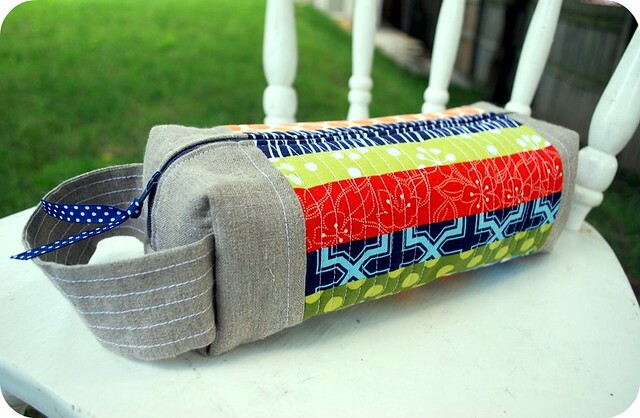 But after work today, I came home and worked again with those little fabric strips I was telling you about last time. I don’t know how it’s possible, but those strips have pulled me out of my slump and I’m ready to make so much again. 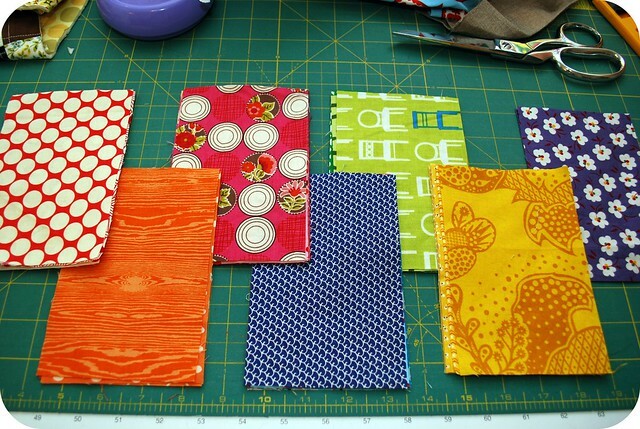 Tonight, I worked on a few pouches and journal covers and everything came together without stress. It’s the kind of feeling where you’re excited about the project of the moment, but you can’t help but think about the details of the next three projects as well. I wish I had more photos to show you, but I promise there will be much more in the days to come. I’m so ready to get back to work. Now, if only I hadn’t have run out of white linen, this project would be going much smoother. I am insanely fed up with being at a creative block. Today, out of sheer frustration for not making progress on anything, I forced myself to start cutting pieces for….something. I don’t even know what I’m making. I just felt that if I didn’t do anything, that I’d feel even more behind and blocked. I’m not sure it really helped. I’m doubting choices in colors and sizes and I don’t even know what I’d like for it to become. Yesterday I spent the majority of my time in the sewing room looking at what I have, and not being able to make any decisions. 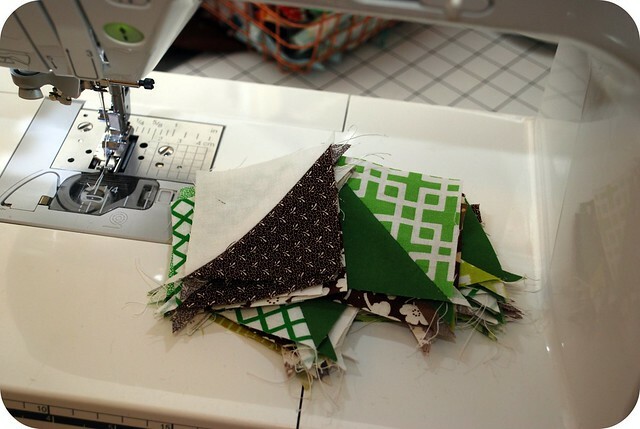 Finally, I cut up some green, brown and white 3 inch, half square triangles and sewed them together to work on a bag idea I had some time ago. I wasn’t happy with the colors together, and so now they’re just sitting and waiting for me to decide what I should do with them. I don’t know though. 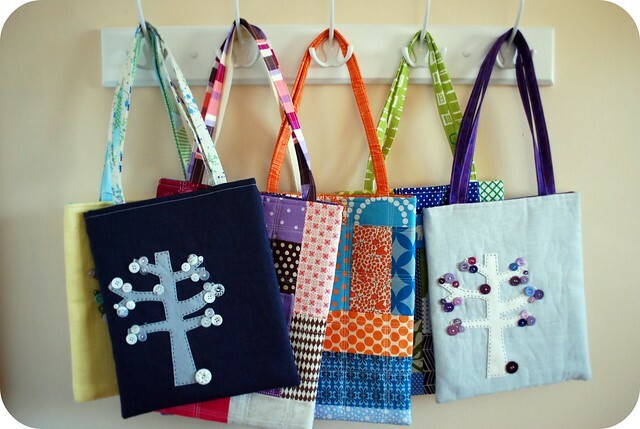 I should be spending my time working on my half-finished lunch sacks, but after a series of pretty major mistakes in the process of making them, I’m frustrated with them. I’d like to finish them and get them off to their respective new homes, but I’m overwhelmed with finishing them. I’m genuinely frustrated with my mindset these days. I want to work on projects and make strides in finishing things, but I’m having a lot of issues with self-doubt and second guessing. I’m having a lot of trouble shaking that feeling and just getting on with the making process. I’m not sure what the problem was, but I was in a funk on Sunday. The previous day I had some trouble with the lunch sacks that I’ve been working on, and it landed me in a grumpy, un-creative mood all day. I tried so hard to pull myself out of it, but things were just not meant to be. I needed a little break. I finally managed to pull it together late in the day and I put this little fold over clutch together–not perfect, but a decent first try. I bought the pattern from Keyka Lou and although I think it’s a well written pattern, I’m just not sold on the usefulness of it. Do people really carry clutches? I’m not sure if I could classify myself as a clutch-carrier. I thought they’d look really cute all patchworked-out, but I’m not sure if it’s worth my time to make more. I’m just feeling lukewarm about it. So although I’m not feeling so grumpy, I feel like my inspiration is still dwindling. I know the deadlines for spring shows are just around the corner and I’m trying to get a jump on having things made. 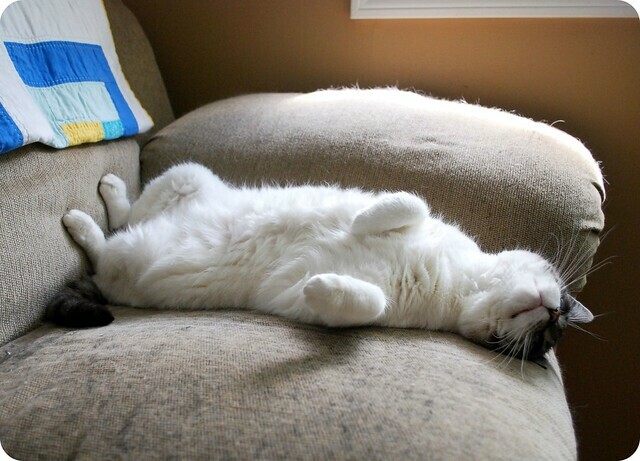 Is it the cold weather that’s making me feel so sluggish? I’m wishing for spring warmth to sneak in and melt my frozen bones. …home from work, Friday afternoon. 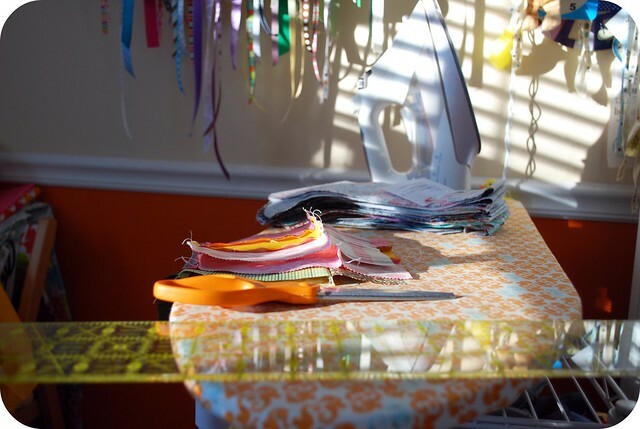 A sunny sewing room. No other plans for the weekend other than to spend my time here. Happiness is making things. Sometimes it makes me so happy that I can’t even believe it.